Are you doing thé same guidlines? In our institute we are usually waiting that acute hematoma become chronic one! The guidelines are the official guidelines from the Brain Trauma Foundation. I fully agree with your comment to wait IF possible. 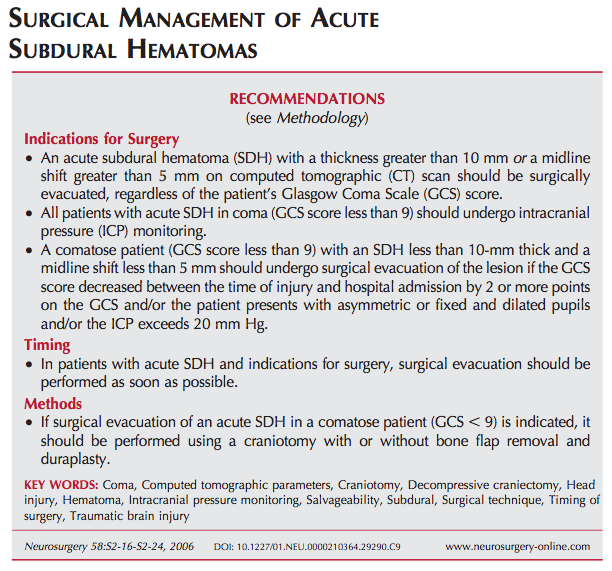 The guidelines suggest that if some criteria are met (as displayed in the flowchart), surgery should not be postponed. In my personal experience, the US-based guidelines are more aggressive than we would be in Europe. I think that this is your experience from France too. Thanks for the remark.